Is this the ONLY REAL medium tank on the market? We should buy a few just to see what they're doing! Norinco, China’s giant conglomerate that produces AFVs for the People’s Liberation Army (PLA), exhibited a wide array of vehicles at Airshow China 2018, and this article outlines most of the newcomers at the event in Zhuhai in November. Prominent was the VN1-based 8x8 family of armoured vehicles (known as the Type 09 in PLA service). A plethora of variants for the PLA and for the international market already exist, but Norinco showed the VN1D, VE36 reconnaissance and command vehicle, and VE32A reconnaissance vehicle for the first time. Because Norinco provided no vehicle specifications other than the nomenclature, it is difficult to provide details on each variant. However, the amphibious VN1D had a slightly raised roofline over the rear compartment as well as firing ports in the sidewalls, suggesting it is primarily a troop-carrying vehicle. It also had a one-man turret mounting a small-calibre cannon and a coaxial 7.62mm machine gun. The VE36 has no turret, but rather a raised rear troop compartment. At the left rear is a telescopic mast bearing an EO and radar sensor suite that protrudes through the roof. The only armament is a heavy machine gun for self-defence. The VE32A, meanwhile, is described as a multipurpose reconnaissance vehicle, thus having an EO sensor suite mounted in the centre of the turret above the main armament of a 30mm cannon. The sensors are mounted on a hydraulically raised mast. Impressive in Norinco’s exhibition hall was the SH11, an 8x8 version that mounts a 155mm howitzer in a large turret. Such an artillery vehicle would give mobile armoured units considerable indirect firepower. Also present was an unnamed 8x8 variant fitted with Red Arrow 10 (HJ-10) antitank missiles. This features the same eight-cell launchers found on the AFT10 tracked vehicle used by the PLA. The 76kg HJ-10 non-line-of-sight missile has a 10km range and can penetrate 320mm of rolled homogenous armour at a 68º angle. Norinco also showed scale models of other variants like the VN1 8x8 ambulance, VN1 fitted with a 122mm howitzer in a turret, SWS2 antiaircraft gun and VS27 recovery vehicle. A smaller wheeled vehicle making its debut at Airshow China 2018 was the VN21 4x4 wheeled personnel carrier. However, no data is yet available on this vehicle. Moving on to tracked vehicles, the VN11A, VN12 and VN17 are all tracked IFVs. The former is a development of the VN11, which is the export version of the ZBD04 IFV widely used by the PLA. 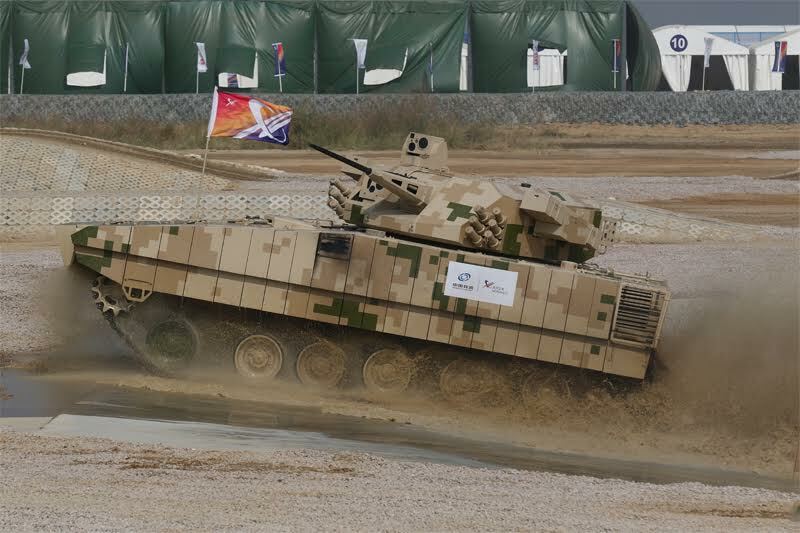 However, the VN17, unveiled in August 2017, represents the latest generation of Chinese IFVs. It is armed with a 30mm cannon, coaxial 7.62mm machine gun and HJ-12 antitank missile launchers mounted either side of the turret. Catering for the export market, the 30t VN17 is powered by a 605kW turbocharged diesel engine that offers a top road speed of 70km/h. Applique armour can provide STANAG Level 6 protection, according to Norinco. The VT2B MBT was shown in 2018, but Norinco made no indication as to how it has been upgraded from the pre-existing and cost-effective VT2. It was originally thought that the fitting of an RWS containing a heavy machine gun marked a VT2B, but a regular air defence machine gun on the display tank belied this belief. 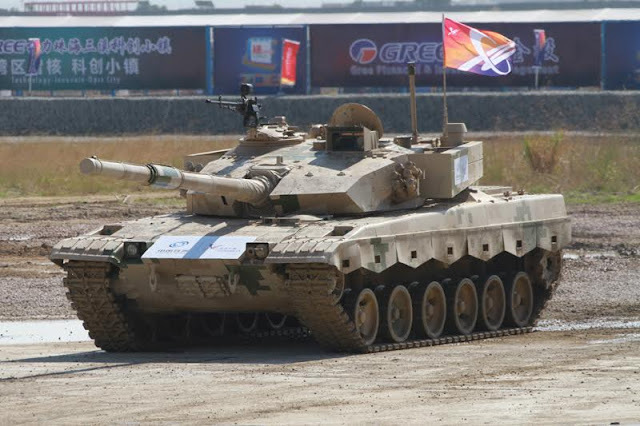 A VT2, plus examples of the VT4 MBT (also known as the MBT-3000) and the relatively new 36t VT5 light tank performed in the outdoor demonstration area. The VT5 operates with a crew of three and features a three-man crew. A 605kW engine offers a top speed of 70km/h. Artillery systems were also prominent. The SR5 multiple rocket launcher (MRL) system was seen mounted on both a 6x6 truck and a Dongfeng 4x4 chassis. The latter is a lightweight MRL featuring 20 tubes and it is known to be in service with the PLA Air Force (PLAAF). The SR5 MRL can fire both 122mm and 220mm rockets. The SH15 is a new truck-mounted artillery system mounted on a Shaanxi 6x6 chassis. 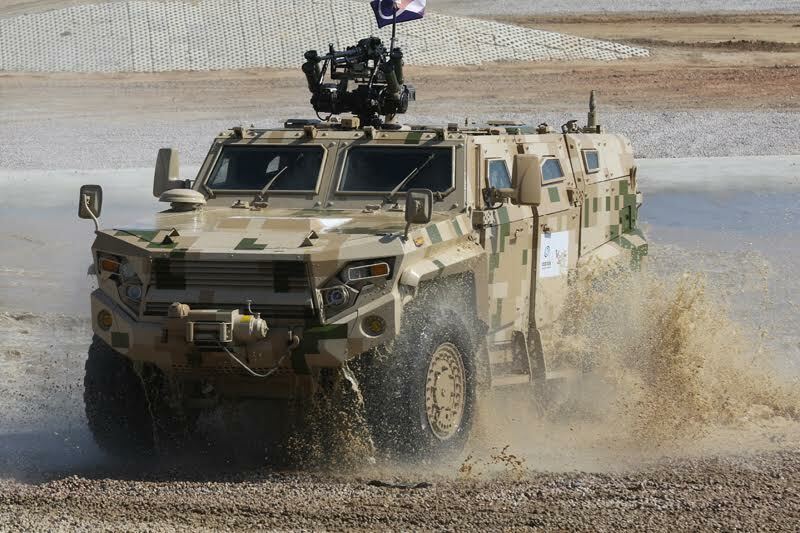 At the front is an armoured four-door cab that accommodates the five-man crew, while the 155mm L/52 howitzer based on the AH2 is mounted on the rear. The weapon, which has a semiautomatic loading system, can fire standard NATO ammunition. Two spades lower at the rear before firing to provide stabilisation for the SH15, while elevation and traverse are achieved hydraulically with manual backup. The howitzer’s firing range is listed as 20km with regular ammunition, rising to 40km with rocket-assisted projectiles. The SH15’s weight is estimated to be in the order of 22t. Chinese weapons have gained significant traction in places like Africa, the Middle East and parts of Asia. Finally, the Airborne Corps of the PLAAF displayed several vehicles alongside a Y-9 transport aircraft. These included two tracked vehicles that complement the 8t ZBD03 light IFV (export name VN10) that can be airdropped beneath parachutes. The latter features a 30mm cannon, but one of the new variants for the Airborne Corps features a turret mimicking the Bakhcha-U turret used on the Russian BMD-4M. It thus possesses a 100mm gun, 30mm cannon and 7.62mm machine gun. Also new in this light tracked family is a variant boasting a 120mm howitzer/mortar. 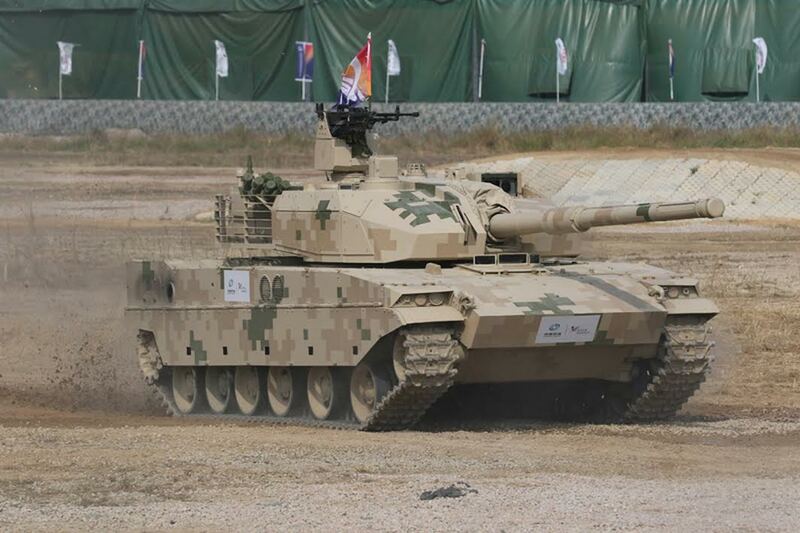 This is the same weapon used on the PPZ10 based on the tracked chassis of the ZBD04 and used by PLA ground forces. These two new tracked vehicles give Chinese paratroopers instant indirect firepower after landing by transport aircraft or being parachuted into a drop zone. The PLAAF’s Airborne Corps also operates the 7t QL550 4x4 armoured reconnaissance vehicle, as used already by PLA ground forces. The paratrooper version has a Type 99 30mm cannon mounted in a turret. Such vehicles, each with a crew of four, were seen undergoing trials in Tibet last year. While Norinco is clearly seeking to expand its AFV exports, the Zhuhai Air Show illustrated idiosyncrasies in its marketing methodology. In its indoor exhibition hall, there were no brochures or data specifications available on any of its products. Then, during the twice-daily outdoor demonstrations, all commentary was provided only in Mandarin, which did little to bring exposure or understanding to the wider international community. Then again, the vast majority of the state-owned Norinco’s business will be done via government-to-government avenues, so in the end perhaps it does not need to put much effort into advertising its diverse and bewildering range of products to a general audience. I hate our foreign aid. In my opinion we spend too much in other countries when we have so many needs at home. Additionally I hate our military foreign aid in the form of subsidized sales. Having said that its apparent that we have to meet and beat China on this ground. That means targeted foreign spending....perhaps we take a page out of the Chinese playbook and setup foreign aid based on employing US corporations building the infrastructure and link it to some type of commodity return (I guess what we did with the GCC in regards to oil). As far as military aid, we need to attach some type of strings. We send our Special Ops and conventional forces to help you with your terror problem then you're buying our gear. Full stop. No questions asked. We'll give you a deal on it but if we bleed then the least you can do is buy our stuff. Once again the Chinese are eating our lunch and they're obviously trying to get market share. We've got to beat them at their own game.